Hemis festival, celebrated on the 10th lunar day of the Tibetan calendar, welcomes and allures plenty of Buddhish devotees and holiday makers to the captivating land of Ladakh. Ladakh goes into the celebration mood around the richest and principal Ladakh Gompa amidst the riveting natural backdrop and snow clad mountains. The overwhelming fiesta of Ladakh is celebrated on the birth anniversary of Guru Padmasambhava. You have come to the right place to know its significance. Please refer the page to your loved ones if you like the page on Hemis Festival. Know and learn all about the biggest Gompa of Ladakh. 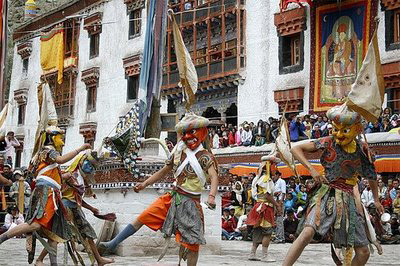 Acquaint yourself with what Hemis festival is all about. Know the significance behind the mask dance of Hemis festival. Watch videos of Hemis Festival . The biggest Gompa of Ladakh, Located at a distance of 45 km towards the southeast of Leh, the capital of Ladakh, is also well known in the vicinity as the wealthiest and holiest monastery of Ladakh. The divinity and importance of the rich monastery is increased duringthe birth anniversary of Guru Padma Sambhava, the founder of Tantric Buddhism in Tibet. 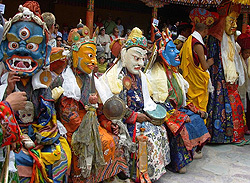 This is the time when the remarkable Hemis festival is celebrated with lot of delight and amusement. 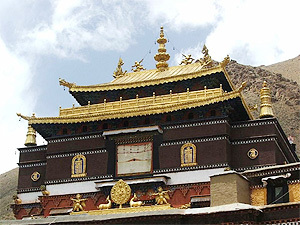 The interesting and engrossing monastery is divided into two parts. The assembly hall is located at the right hand side where as the main temple is built at the left hand side of the temple premise. During the captivating and enthralling festival the dancers who perform masked dance use the hall Dukhang as the green room. The temple is also known as Tshogkhang. The balcony is well garnished with fresco pictures. The 'wheel of life' (Kalachakra) and the lords of the four quarters are the other majestic enticements for the Buddhist devotees and holiday makers. The time when Ladakh gets into the mood of wonderful and pleasant summer, a two days long Hemis festival knocks at the door. The place where the carnival is celebrated is the largest and richest Gompa in Ladakh, called the Ladakh Gompa, built in 1630. The fascinating and colorful festival falls on the 10th day of the Tibetan lunar year. It’s an overwhelming celebration of the birth anniversary of Guru Padmasambhava. The head Lama presides over the entire festival. Buddhist devotees and tourists flock to Ladakh on this auspicious occasion to enjoy the divinity and snow clad mountains. The compelling greeneries around the Gompa entice many. Everyone dresses up in striking and fabulous garb, the ethnic attire which showcases the ethnicity and patent Tibetan culture. The musical instruments like cymbals, long horn and drums accompany the special and unique dance forms. Dancers performed masked dances which are the fortes of this traditional Buddhist custom. The renowned two storied 'Thanka', affluently embellished with marvelous and precious pearls is displayed in every 12 years according to the Tibetan year of the Monkey. The artistic and vibrant Buddhist culture of Ladakh looks even more colorful for its surrounding environment and scenic beauty. The awe inspiring fair which displays the impressive handicrafts is another imperative enticement of the Hemis festival. The masked dance which is the trademark of the Hemis festival exemplifies good prevailing over evil. The bright and out of the ordinary masks are painted with numerous colors. These colorful masks are the most crucial and important part of the dance form of the festival. Each and every mask has a different significance. Expressions differ as well. Dance movements are spontaneous and fantastic but slow. Dance and plays of the festivals are aptly accompanied with the interesting and beguiling tunes of cymbals, long horns and drums. It’s a special and significant Indian culture which is noteworthy and famous all over the world. Faces of different legends are majestically portrayed on each and every mask. The Padmasambhava dance shows the invasion of the Ruta demons. It includes Yama (the God of death), Guru Trakpo (the vanquisher of all demons) and magician with black hat. 1.Who presides over the Hemis festival? select answer 30 km away from Leh. 45 km away from Leh. 40 km away from Jammu. select answer The birth anniversary of Guru Padmasambhava. The death anniversary of Guru Padmasambhava. select answer The founder of the monastery. The founder of the tantric Buddhism. Buddhist monk. 6. Dancers perform which kind of dance during the occasion? 7. Hemis festival is celebrated in which state? select answer Hindus. Muslims. Buddhists.